When the third Jewish Temple is rebuilt it will be a definite end times sign. This video shows that the historical evidence supports the Jewish Temple was built in the old city of David above the Gihon Spring so that water could be drawn up for purification purposes. 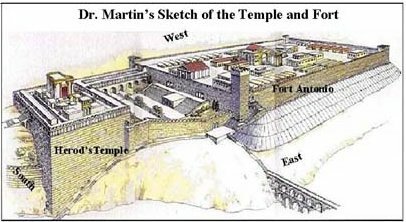 The Western wall therefore is not the wall of the Herodian Temple but part of Fort Antonio built by Herod to house the Roman soldiers. This picture shows that the Temple is connected to Fort of Antonio (it housed 10,000 soldiers) by a Causeway. The Fort is enormous whereas the Temple was by comparison small (600 ft square) The temple was built in the old city of David which is south of the so called Temple Mount. The Dome of the Rock and the Aqsa Mosque sit on the site of the Fort Antonio not the Temple Mount. Hence there is nothing stopping Israel rebuilding the Temple on its original site except tradition. Israeli Temple Institute has already made the altar, tools and clothing required. It also operates an educational centre and a preparatory training programme for members of the priestly family who want to be ready to serve as soon as the temple is rebuilt. Watch to see what triggers the rebuild for it will happen.